Characterized by a bending of one or both joints of any but the big toe, hammertoe is a common podiatric issue. When individuals begin to experience intense pain in their heel, many know that they have acquired plantar fasciitis. Heel pain is an extremely common and potentially disruptive affliction that has many possible causes, including stress fractures, arthritis, nerve irritation, cysts, tendonitis and most often, plantar fasciitis. Diabetes is a condition in which excessively high glucose levels in the blood can jeopardize the health of the liver, eyes, kidneys and blood vessels. Plantar warts are benign (noncancerous) growths that occur on the sole, heel, or ball of the foot. Most often found on the inner foot near the big toe but sometimes located on the fifth toe, bunions are a painful yet common condition caused by inflammation of the bursa. The human body is amazing in its ability to protect itself from repeated pressure and stress. It is this adaptive tendency that creates calluses on the feet. Although they can start out as a small nuisance, ingrown toenails can become a real problem if left untreated. When you have problems with your feet, you need to turn to a podiatrist who listens and responds ... an experienced doctor who knows the field and can effectively diagnose and treat your needs ... a friendly physician who counsels you on the best ways to maintain and improve your health. Our physician meets all these criteria. Plus, you benefit from a dedicated team of trained professionals who give you the individualized attention you deserve. 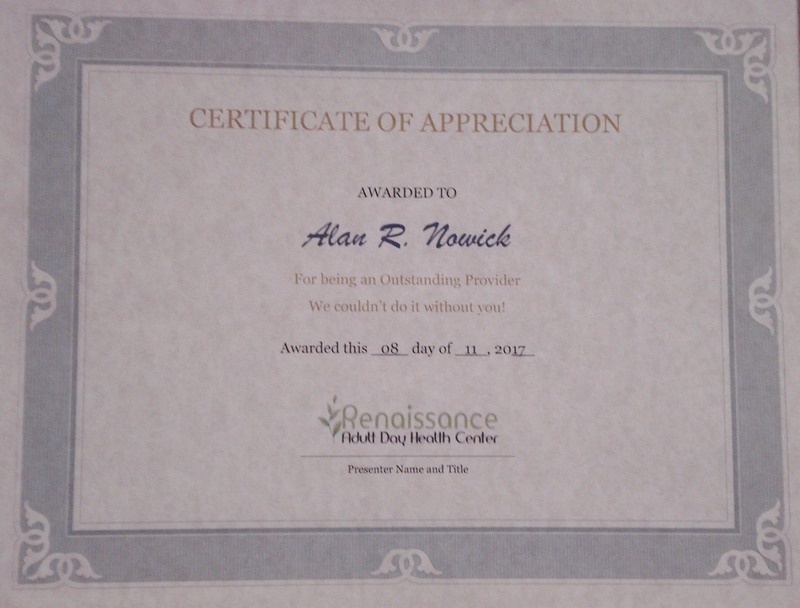 Alan R. Nowick, D.P.M. believes that informed patients are better prepared to make decisions regarding their health and well being. That is why we've included an extensive section on this web site covering the full array of topics associated with podiatry and podiatric diagnoses and treatments. We encourage you to look through these pages whenever you have an interest or concern about your feet. The best care in the world doesn't mean anything if you can't access it. At Alan R. Nowick, D.P.M.,we strive to make our Cranston RI office as efficient and convenient as possible. Included in these web pages is information about Alan R. Nowick, D.P.M. 's office, including our Cranston RI locations, maps, directions, hours, insurance policies and appointment scheduling. You can even email a request for an appointment right here! Since 1988, Alan R. Nowick, D.P.M has been providing gentle, thorough, pain-relieving podiatric care for patients in Rhode Island and surrounding states. I enjoy my work and love helping people: My staff and I are very concerned for your foot health, and strive to give you the individualized attention you deserve. Therefore, we do not double-book, and make every effort not to overbook, my schedules. We service the Cranston, Johnston, North Providence, Providence, Warwick and West Warwick, Rhode Island areas.